This work, identified by PublicDomainFiles.com, is free of known copyright restrictions. 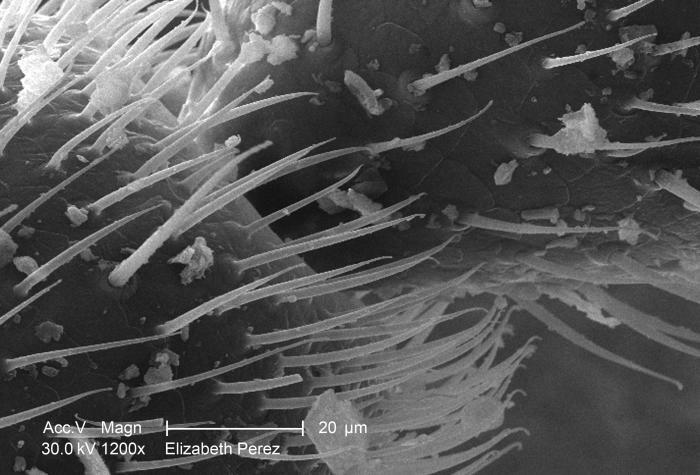 Under a moderately-high magnification of 1200X, this scanning electron micrograph (SEM) revealed some of the ultrastructural morphology found on the surface of an antenna situated on the head region of a termite found in Atlanta, Georgia. In this particular view, the joint connecting two antennal segments is the focal-pont of this image. Why is this picture in the Public Domain? The file available on this page is a work of the United States government. A work of the United States government, as defined by United States copyright law, is "a work prepared by an officer or employee of the U.S. government as part of that person's official duties." In general, under section 105 of the Copyright Act, such works are not entitled to domestic copyright protection under U.S. law. Where is this picture from? How may I use a Public Domain picture? The file available on this page in the Public Domain. Files in the public domain have no restrictions on use and may be used for any purpose, without any conditions, commercial or not, unless such conditions are required by law. File contains an identifiable person and such person has not provided a model release. File contains an identifiable building or structure and the owner of such building has not provided a property release. File contains a registered corporate logo or trademark. Files containing any of the above elements that do not also have a provided release would generally fall under editorial uses only and may not be used for commercial purposes. Users downloading files that are designated as "editorial use" assume full responsibility for their use of the file(s). Depending on your use, the use of editorial use files may require additional rights that publicdomainfiles.com or the copyright owner may or may not be able to provide. You should consult with your legal counsel to be sure your use is legal. By downloading this file, you indicate that you understand and agree to all of these terms and assume full liability for your use of the file(s) and agree to hold publicdomainfiles.com harmless should any liability arise.